It’s August Bank Holiday Monday and I am recovering from ‘Woodstock Live’… a festival of music which I organise in the town that gave its name to the greatest festival of all time…… (I refer of course to Woodstock, New York State 1969!) We put on two days of an eclectic mix of open air music on the town square, for free and it seems like we do it every year now at the same time. When not ‘working with wood’ I am very involved in music. If you have been in our showrooms, some of you may have wondered about the various CD albums dotted around our showrooms. The first ‘Guitar Orchestra’ CD cover combined my two passions, with a photo taken on a beach in Wales of my guitar collection leaning on a selection of antique rush seated ladder back and spindle back chairs with a few Windsor chairs thrown in for good measure. The tide came in quite a lot quicker than we imagined and the whole experience was slightly fraught! The albums represent past and present musical journeys of which the current phase is ‘tp & woodman’ (www.myspace.com/tpandwoodman )……..
‘Tp’ refers to Tony Poole, founder member of ‘Starry Eyed and Laughing’ who were kind of like Britain’s answer to The Byrds, who despite much touring, both at home and abroad and receiving much critical acclaim in the mid seventies, never really ‘made it’ to the big time. He recently contributed a track to a Byrds tribute album. He is simply the hottest 12 string guitarist around. ‘Woodman’ is a moniker given to myself by ‘Big Vern’ (aka Mark Vernon, former manager of PJ Harvey and now looking after B J Cole and QueenAdreena amongst others) during the recording of the album ‘Lullabies for Lager Louts’ at Peter Gabriel’s Real World studios in Box, with the legendary John Cale producing. It was a fun two weeks, albeit, some years ago now. The name has stuck in certain quarters. We describe the music of tp and woodman as ‘raga inspired sound and light’…. According to punters it’s ‘kind of like Pink Floyd heads East… Hank Marvin on acid… wicked guitars’…. In the land of wood, there are some exciting things happening too. We have recently added a new Windsor chair to our collection. 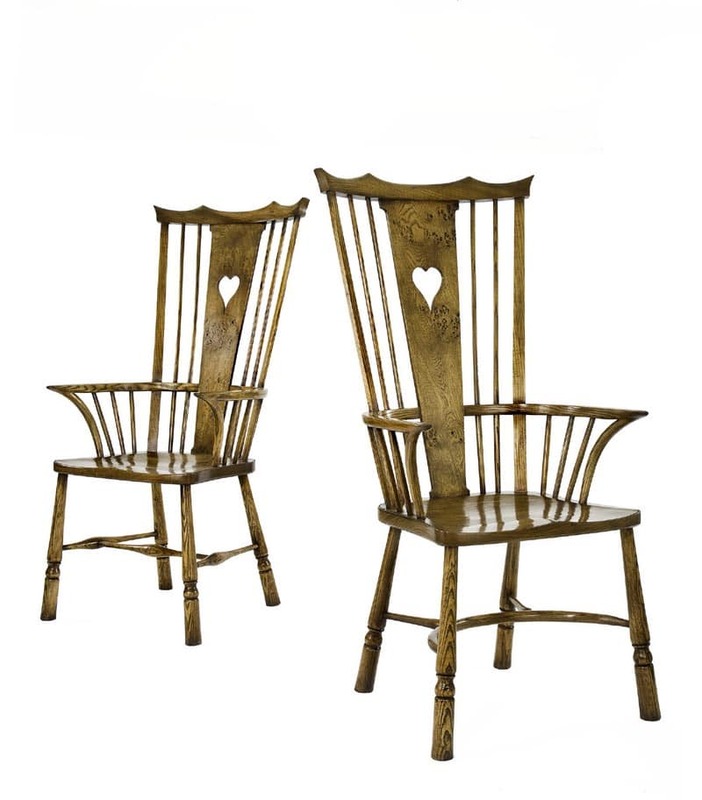 It is based on the design of a late 18th century Thames Valley comb back chair, but as ever we have altered the design to suit the frame of 21st century man and woman and in this case, we have designed a fretted splat for the back that speaks of both tradition and the contemporary. At just under 50” to the top of the comb this is a chair that makes an impression. We are using elm from a limited stock to make the seats and the top comb. The splats can also be made of elm or from beautiful burr oak (as photographed). The other parts are made in ash. The chair can be finished in many different ways, but we really like the ‘light antique’ finish on the chairs in the photograph. It allows the beauty of the various grains to show through and can complement both lighter and darker pieces. We call this chair ‘The Wychwood Comb Back Windsor Chair’. The Wychwood Forest used to cover many thousands of acres of what is now West Oxfordshire, including the area around Woodstock, where this chair has been designed and ‘brought to life’. The Real Wood Furniture Company is a friend and supporter of ‘The Wychwood Project’, established in 1997 to raise awareness of the history and identity of the area, and to work with local communities to restore its rich patchwork of landscapes and habitats within the Forest boundaries. It’s a good synergy and reason enough to name an exciting new Windsor chair. We are also founder members of ‘Woodland Heritage’ a charity dedicated to increasing the woodland area in the UK. ….’The Heritage Windsor??? ?’ hmmm food for thought, but for another day. Hope you enjoyed a relaxing Bank Holiday and that we see you soon. PS For those of you seeking an update on the life and times of ‘Scrumpie-pup’…all is well in Scrumpie land. She is just over 11 months old now and becoming a firm favorite with customers old and new. I will post another pic soon.